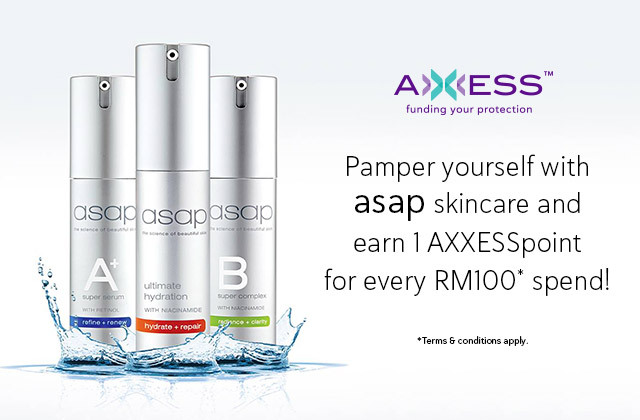 Pamper yourself with asap skincare and earn AXXESSpoints! Tell me More : AXXESS members can now earn AXXESSpoints every time you visit asap@The Boulevard Mid Valley. Remember to flash your AXXESS card to collect AXXESSpoints. AXXESSpoints only earned upon purchases of RM300 and above (RM100 = 1 AXXESSpoint). Reservation via phone call to be made to 03-2201 3635 or 018-322 7777 a day prior to appointment. Shieldcard reserves the right to refuse, alter, amend, delete or add to the stated terms & conditions or withdraw this promotion at any time without prior notice. Please see http://www.axxess.com.my/doc/tc.pdf for the terms and conditions of the AXXESS programme.